Most of you know that our little sassy 4 year old, Madelyn was born on 8/16/13 via C-section due to being breech and diagnosed with severe bilateral hip dysplasia at 1 day old. She was placed in a harness at one day old, after 6 weeks she ended up having nerve damage and was unable to move her legs for several weeks. On her 5 month birthday 1/16/14 we headed into Boston Children's hospital and Madelyn underwent a bilateral open reduction hip surgery which lasted 4 grueling hours by the amazing Dr. Benjamin Shore. 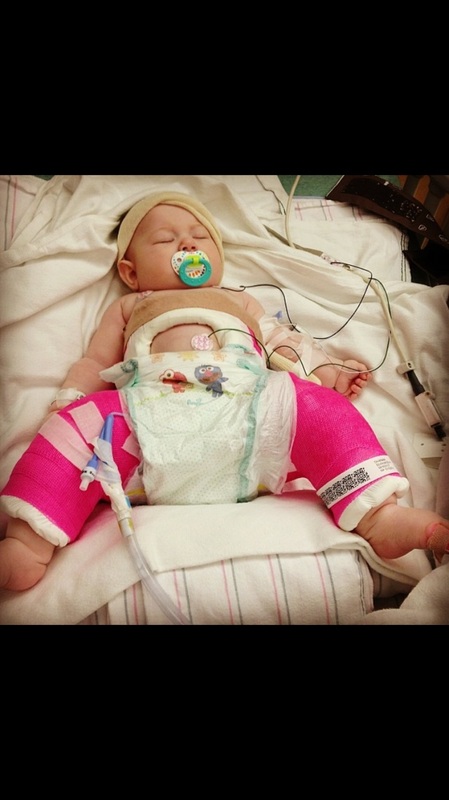 Madelyn was then placed in a full body spica cast for 12 weeks. At such a young age, Madelyn required many months of intense physical therapy and in home early intervention which resulted in financial hardship for both Jeremy and I as I was forced to take a leave of absence from work to care for Madelyn for 11 months. Our little fighter Madelyn had the odds stacked against her as Hip Dysplasia is found present in 1. First born 2. Females 3. Breech babies 4. Genetic predisposition. All of these were Madelyn! We are now finding that Madelyn is a very flexible little girl and has been diagnosed with an unknown type of Hypermobility Syndrome, which Boston Children's will continue to follow her over the years to see what becomes on this syndrome. We have been told she may require future surgeries as her hips are still not exactly where they should be. We are raising money for this fundraiser to support Boston Children's Hospital research and testing for Hip Dysplasia. As some of you might know we are expecting our second baby girl in November! We are unsure if this baby will also have the genetic disposition that Madelyn has which is why Jeremy and I advocating for Madelyn and all the other children and families that have been touched by this. We are very passionate about this research and will do anything to raise money to provide necessary funds for Hip Dysplasia research! Thank you all in advance, every little bit counts! So proud of you Madelyn! !